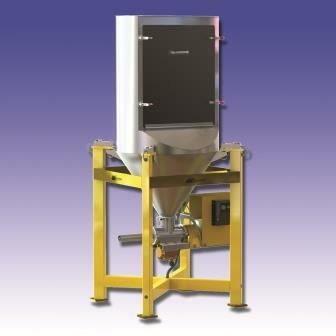 Scaletron Industries offers a new line of volumetric screw feeders. Scaletron Industries Ltd, a manufacturer of corrosion-resistant digital and mechanical scales, introduces a new line of volumetric screw feeders for metered dispensing of powdered or pelletized chemicals into water, wastewater, and chemical treatment processes. The Model VMF-28 auger-style feeders feature a fully integrated Scaletron scale. Precise dosage amounts are automatically weighed and added to treatment processes without requiring an operator to measure and weigh amounts. Data is displayed at a central monitoring station where operators can quickly make adjustments as necessary from the control panel. Besides saving operators time, the new VMF feeders improve accuracy because the integrated scale continually monitors weight loss or gain. Heat, moisture, and other environmental variables can cause additives like lime and carbon to absorb or dissipate water which changes the compound’s weight. These subtle changes can go undetected when a measured amount of additive sits on a loading tray waiting to be used. This can result in not enough, or too much material being introduced into the treatment process. The Scaletron feeders eliminate this risk by providing operators with constant real-time assessment of the total mass of additive being used. Featuring rugged and durable steel construction, the Scaletron VMF feeders have a corrosion-resistant finish. The new feeders accurately meter dosing additives such as alum, carbon, lime, polymers, soda ash, and other dry powders or pelletized materials. VMF feeders use a heavy-duty, gear-driven auger to continually feed material into the built-in stainless steel hopper at a rate of 0.2 to 35.4 cu ft/hr. Hopper capacity is 2.8 cu ft with larger sizes available. The Model VMF-28 volumetric screw feeders are available with 0.75- to 2.5-in.-diam solid augers to dispense material from the supply hopper into treatment processes. Also offered are 1.5- to 2.5-in.-diam open helix style augers. In addition, a wide range of accessories are available including: an independently controlled vibratory agitator; lift-off, hinged, or fixed lids for hopper; hopper extensions for additional capacity; bag loaders for 50-lb bags; mixing tanks and wetting cones; base stands, loading platforms, and bulk bag unloaders, plus dust collectors and explosion-proof systems. The integrated scale employs four load cells each with an adjustable stainless steel leveling bolt. The scale measures changes in volume to 0.5% accuracy. Controls are housed in a NEMA 4X, UL-approved enclosure. The VMF-28 models are compatible with Scaletron’s line of scale indicators and controllers. These include the Model 1020 5-digit controller and Model 1020-B 5-digit batching controller V5, which are programmable units that monitor and automate dosing and dispensing processes.